There's a widespread misunderstanding that you need to work with visual creativity to be creative. Creativity is inside all of us and we use it daily. Me and Mark work in very different industries: film/photography and IT respectively, but we're equally creative and use our creativity on a daily basis. The way we see it, creativity is just a way of finding an "out of the box" solution to a problem. But sometimes we both have the urge to create something with our hands. Let time slow right down and use our hands to create something from ourselves. On the Isle of Eigg there are two wonderful, creative people named Catherine and Pascal and their world is all about willow. And that is also the name of their company: All about Willow. Me (Thea) and Anna (Mum) went on a half-day willow weaving workshop and weaved two willow-fish and more importantly created something with our hands. This blog post is about this workshop, but also about hand craft and why it is such an empowering activity! Catherine Davies and Pascal Carr work and live on the Isle of Eigg, and their world and business is "All about willow". They grow their own willow and use their hands to craft beautiful baskets to both UK and international customers. They are talented and sought after basket makers who are fulfilling their dreams by being just that. All about willow also share their knowledge through basket weaving courses, and a taster course for visitors on Eigg. We were lucky enough to go to one of their taster courses, held on their Scottish croft at the end of the road. When I say the end of the road, that's because there is just one road on Eigg and their croft is at the end of it. You can not miss it! The taster course was a half-day workshop where we chose between a few simple objects to make. Learning about the material and technique was not easy, but we both managed to go home with two twiggy, chocolate brown, willow fish. We loved learning the different techniques and skills that Pascal taught us, while Catherine shared her experiences in deep conversations about handcraft and why it's such a "giving" activity. We left the workshop feeling conscious, aware and proud of ourselves for taking the time to slow down and connect with something in our self. Catherine Davies on one of their new willow fields, Isle of Eigg, Scotland. Creating something with your hands from local materials imparts a wonderful feeling. When we were living on the Faroe Islands I bought a lot of local wool, and used Faroese knitting patterns. To me there are many similarities between the Faroese knitters (including myself) and "All about willow". 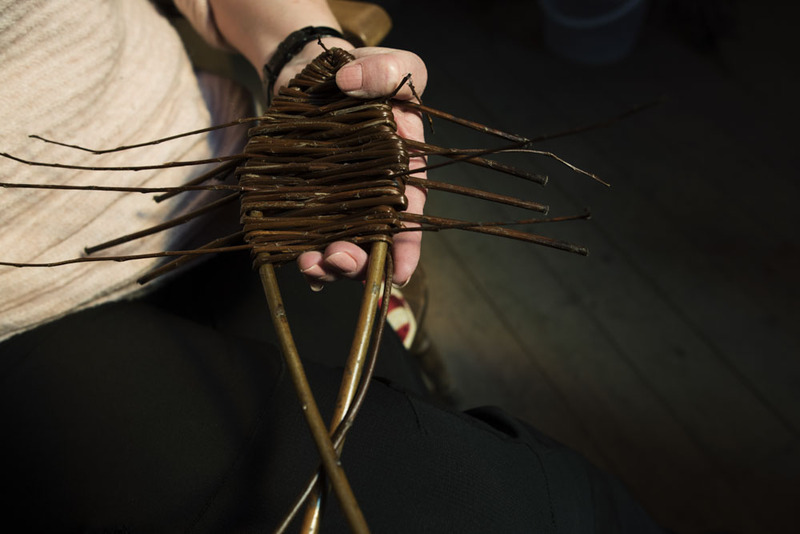 Taking something from nature, something local, and then using your hands to create something functional, whether it be a knitted jumper or a willow basket. It's sustainable and you feel connected to both people and place. It's the place that provides the material and the people that through generations have developed a technique. For me, handcraft is the perfect way to experience the synergy between people and place. Catherine and Pascal grow all their own willow at the croft. The pictures above are from their latest field. As Catherine showed me the new field, she was crushing the weeds underfoot to help new plants grow. We both spent time walking slowly through the plants, crushing the weeds as we went. It was so nice to see all the little seedlings that would soon grow and eventually be turned into baskets. To keep wood in, to carry laundry, vegetables or mushrooms when out foraging. There's so many everyday baskets that are made from willow (or similar plants in other parts of the world). Today, many of these baskets are made in plastic, but traditionally they were handmade by basket makers. All about willow are in may ways keeping both a profession and a tradition alive. Making your hands do what your mind wants is not always easy. Pascal showed us step-by-step how to hold and move our hands, but it was still a challenge. I actually handed mine over to Mum and she finished mine as I was making a small interview with Catherine (see video at top of the post). So, I can't claim to be a willow fish maker, but I do know how difficult is was to hold, weave and tighten at the right places all at the same time. I also agree with Catherine that the thing I appreciated the most was absolutely the time and the focus to just be me. This was a unique dive into Catherine and Pascal's world of willow, but most importantly the workshop was a conversation about craft and the empowering side effects of using your hands to create something that comes from yourself.